It’s time again for another Atlantic Hearts Sketch Challenge. If you’re new to my blog, I am part of the design team so twice a month I post cards based off of their sketches. This week we are on sketch #156! 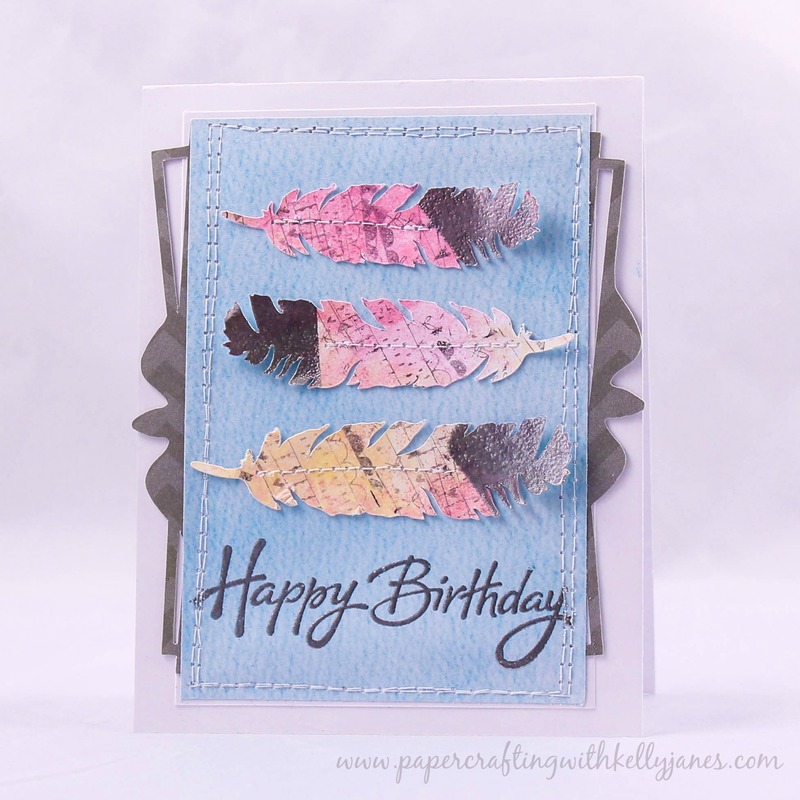 My card this week is a true scraps card! Every part of this card was created off of scraps that I had left over from previous projects! I started with a white card base and cut a second layer of the same white cardstock. Then I added a blue pattern paper that I pulled from my scrap box…and let’s be honest! We all have one! Mine is an entire Iris container full of pieces of paper that are 6×6 and smaller. 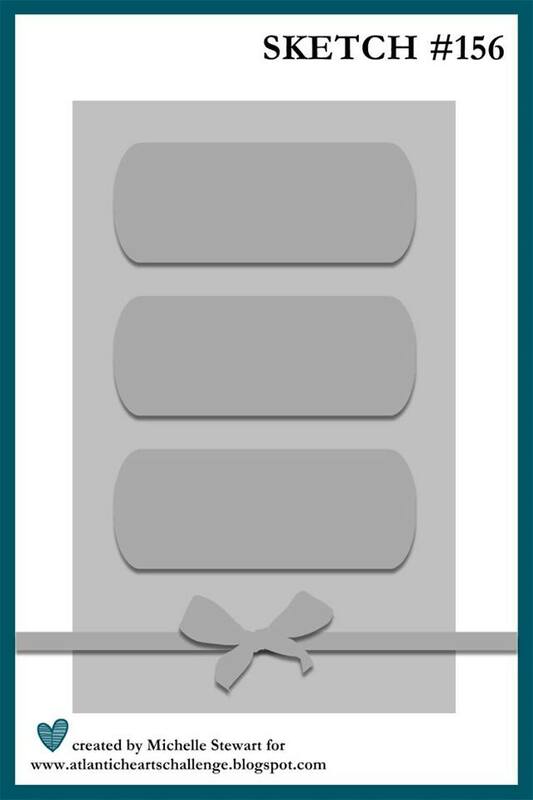 I try to pull from that box each time I make a card. Once I had the blue paper layered, I tucked in a frame that I cut for a previous project that I never used. The frame is the Picture Perfect Cut File from The Cut Shoppe and is cut on a scrap piece of cardstock that is leftover from the retired CTMH Dream Pop Specialty Paper Pack. Now for the feathers which are cut from the CTMH Artiste Cricut® Cartridge. When I do any mixed media on other projects I always use a piece of white cardstock to smear any leftover paint, etc so I don’t waste any product. This cardstock will sometimes have multiple colors of paints, texture pastes, etc. I keep adding excess mixed media products until the entire cardstock is full and use it for projects such as this card. So I positioned the feathers onto my cutting mat so they would hit the pink & yellow mixed media work that was leftover from a previous project. 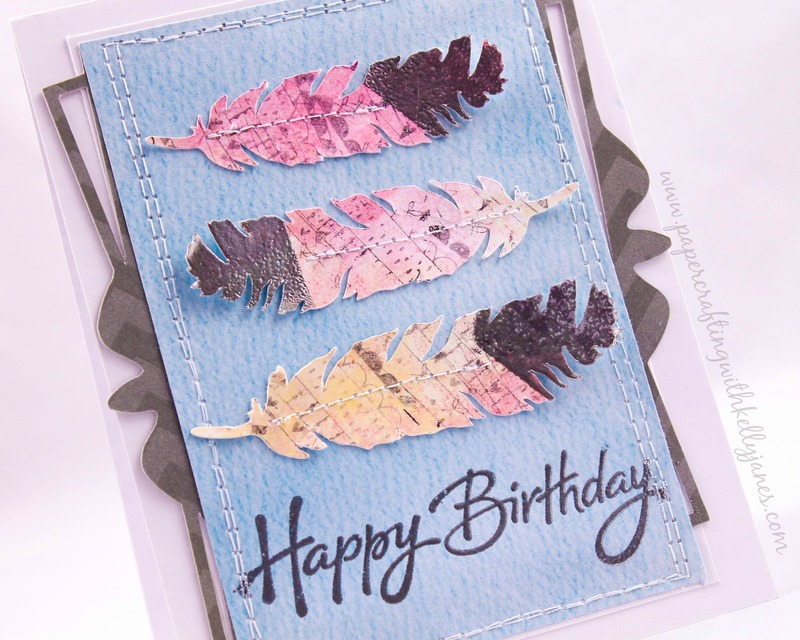 After the feathers were cut and still on my cutting mat I added third generation stamping using a Pink Fresh Studio Stamp and CTMH Black Exclusive Ink™. 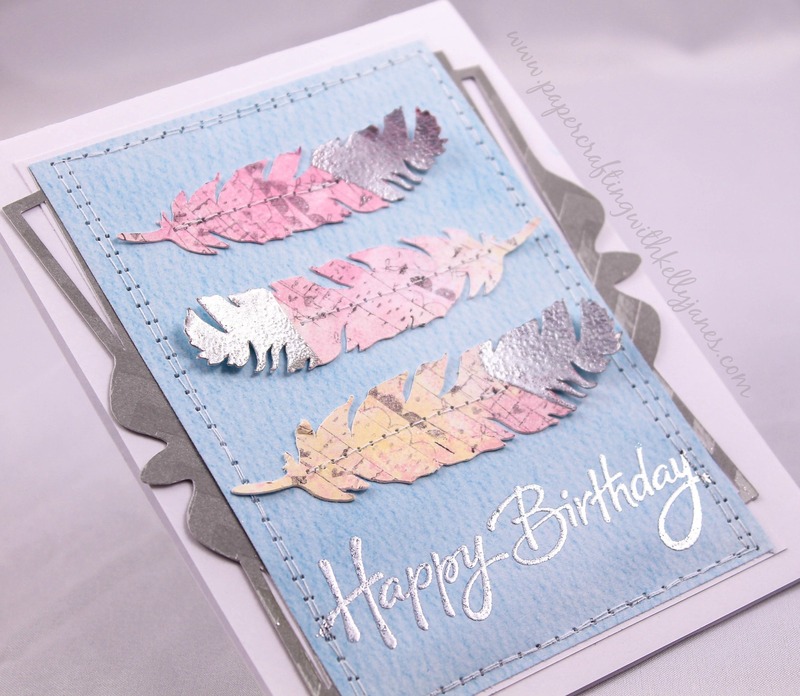 After the stamping was done I removed the feathers from my cutting mat and smeared Versamark™ Ink on the tip of the feathers and sprinkled with Silver Embossing Powder to add a little more texture to the feathers. I added the feathers to the background papers and added white stitching around the entire card and through the center of the feathers. My sentiment is from the CTMH Joyful Birthday Stamp Set using the same Versamark™ Ink & Silver Embossing Powder. I hope you’ll head over to Atlantic Hearts and enter your interpretation of sketch #156. The feather cuts look really cool.